The same song was sung by Lata too as a solo in the same movie. I know that; Meri zindagi hai kya ek kati patang hai had a Lata version as well, but the OP says it is not from Kati Patang. So then, which film can it be? And which song is it? I came across Piya main hoon patang tu dor from Ragini (1958). Does not mention kati patang, just patang. Wow. 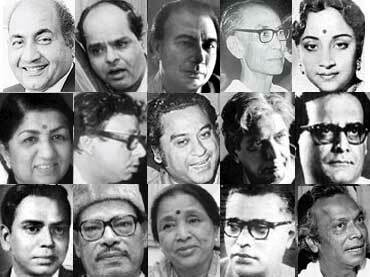 Your blog is an encyclopedia for followers of old hindi songs of 50s and 60s. I am afraid that I am going to get lost in all those wonderful posts of yours. Thank you so much for the appreciation, Krishnan. I grew up with these songs, courtesy my father, and I can think of nothing better than to share my love for them with others. That people like you read my posts, and appreciate them (and comment!) is the icing on the cake. Great collection of old songs and the information is remarkable. I am going to refer your website to my father. He will be so happy after seeing the website. Thank you, Naina, for the appreciation. I'm sorry for the delayed reply, but I've been out of town, as you can see from the sadly neglected state of my blog. Please keep reading.I hope your father likes the blog as well. Thanks, Vikrant. I'll surely take a look at that link as soon as possible. Following this blog from not so long, but now I am addicted to it.The segment I like most is the "My favourites". I would like you to make your list of year wise top 10 favourite songs ie, your favourite songs of year 1950, 1951 and so on. You can further divide into best male solos, best female solos best duets like that. Just a sincere suggestion, decision is yours. Thank you, Atif. I'm so glad you like the segment. I take a lot of effort to see that they are representative of the themes I choose. As for your suggestion that I make a '10 favourite songs of each year' list, I humbly suggest that it would be an almost impossible task, especially in the golden years. I'll keep it in mind, however, and see if it is feasible. Awesome collection i your site , i realy enjoy this.i have a song i think you may like this. Hi, An old Hindi song, in female voice, with lyrics like "Phirte rahinge dilwale teri galion mein" in or around the beginning; and something like "yeh to jawani ka nasha hai, zaroor hai" somewhere in the middle is haunting me since many years. No search combination could help me. The song is probably in Bhairavi. Any idea from anybody? I'll have to do some checking... can't think of any song offhand, with those lyrics.